Since 2004, Louis the Scooterer, Louis Scop, has contributed to the-vu, and his readers number in the thousands. Sadly, I have just learned from his daughter that Lou passed away on July 26th 2009, and was buried in the Netanya cemetery, Israel, on 31st July. Lou’s last input was a comment on June 15th, and his last email to me was on June 26th, in which he mentioned he had not been feeling good for several weeks, but would soon be writing another chapter. Some followers of Lou will no doubt learn of his passing with these words. I will be reading his writings again in order to celebrate his life, but of course he did more than he wrote about, and for a lot longer. CategoriesJeffrey the Barak, Louis the Scooterer, PeopleTagsLou Scop, Louis the Scooterer, Obituary, R.I.P. to find the good in all. And he really loved his newly adopted home of Israel, the people and its places. I also found in him a “Kindred Spirit” in his love of Motorcycles and the excitement of the journey. this man was a verry warm and whise man one how learnd me to look on differend ways to life and how jou life it. we mate him a jear ago in israel wen i was there working for ser-hal whit my 2frends marinus and dikkie . we wil remaind him marinus,dikkie ,bas. I was very saddened to hear about Lou’s passing. I felt like I had gotten to know him as a new friend. I commented to his articles several times. I also am a scooter rider and felt a connection there. I have a love for the land of Israel even tho I’m not Jewish. His thoughts and photos afforded me an insight of that land, that I doubt I could have gotten elsewhere. He was most gracious in replying to my comments and e-mails. He and I are similar in age. Unfortunately, I will probably never be able to visit there, but we talked of riding together. I will miss his “documentaries” very much. I will be praying for his family. He will leave a large empty space. May God fill it with Himself. I was quite sick this morning when I read of Lou’s death. I lost my mother on June 30th and to hear Lou was now gone, it hit me hard! Several years ago, Lou taught me some words in Hebrew, some phrases and he was the most patient of teacher’s. I still have all my notes, and will always keep them. I had taken some pictures he’d sent me of his travels, put them on a CD, and made a slide show of them. I added Madonna’s ARGENTINA song and after a year or so he was able to view and hear the CD (he had bought a new computer or something). He commented to me how much he enjoyed it. You will be missed Lou. You will be missed. I feel upset about Lou’s passing. We met in Netanya Israel, where He used to live, last year. And then I had the pleasure to read from him on this website and by e-mail. Months ago, he had asked me for photos from France. I now regret that I didn’t answer his request sooner : I sent him photos from France just a few weeks ago and he never answered me ; and now I know he will never answer me. I must confess that at first I found it strange that he didn’t answer, because he used to answer my mails within an hour or a half-hour. Though he didn’t like to talk about neither politics nor religion, he was very much committed to Israel, and he used to proudly bear a pin granted by the Israeli army for volunteering. In the future, each time I’ll think of the Holy Land, the memory of this wise man will be associated to it. i”m really in shock , i knew he is not so young , but what can i say , we will all die sometime . i work in Pkiin Youth Hostel where lou used to make nights over while touring around on his scooter ,( it was allways funny for me to listen to him saying scooter, i mean i”m not so familiar with southafrican words), we got to meet on several occasions , i really enjoyed things he said about his early life in south africa and he allways lamented on the past , you could tell he really loved his homeland . i will always keep his memory . I did not know Louis. He did not know me. I simply browsed here now and again and enjoyed his articles. I traveled Israel as a young hairy hippy in the 1970’s and loved it there. I also love motor scooters and touring. So I wanted to log in here and just say how much I liked to read Louis’ articles. If his family and friends are reading this, sorry for your loss. He seemed like a wonderful person. Oh No! I will miss reading this travelogue. Sad to hear the news. I just brought up the-vu hoping to see a new Louis the Scooterer installment. Looks like I’m far too late. My best wishes to his family. Thanks the-vu for letting us all “meet” Lou before his time passed. I keep planning to retrace his steps via motor scooter when I go to Iz. He was better than any guide book. Maybe I will leave an offering of a cup of coffee at Netanya cemetary, and chase away some smokers. Have been trying unsuccessfully to contact Lou for a couple of months, then remembered his scootering blog. We are saddened to hear the news of his passing. We spent many pleasant hours with Lou in Netanya drinking coffee in the kikar when we lived there. We will be visiting Israel in December 2009 and would like to go to his grave, if anyone knows details can they please pass it on. We will miss Lou in the kikar this holiday. This just in from Lou’s daughter Mara, in response to Lin and Joe. thank you for replying about the grave location, we will go the cemetery next week. 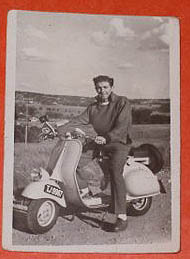 its been 5 months since my dad Louis the Scooterer died. i would like to thank The-Vu for this cyber-support space, and to thank you all for your comments about my dad – it’s been very helpful for me to check back here now and again, and read and reread – and i still draw comfort from the things you have said. and so from cape town, south africa, i send you love and hope you have a safe transition into 2010.
ps. apparently (hopefully) the headstone is up. I ‘discovered’ your father’s blog, while searching for information regarding Sarel. What ‘spirit’! I was looking forward to relaying my story of how I came to learn of Sarel, through no other than Jdate.com an inauspicious Jewish online dating site! I’m now really curious about Lou’s life and history, he must have been an amazing spirited man. If you don’t mind, would you be able to tell me something about his history. I know from reading the blogs, his ‘journey’ began with Sarel, I wonder what was before this. I hope you don’t mind my asking…..